Optimize Your Life, Career, Success and Happiness! OptimizeBooks.com is a participant in the Amazon Services LLC Associates Program, an affiliate advertising program designed to provide a means for sites to earn advertising fees by advertising and linking to amazon.com. Morning Journal vs the Tracking System? In last week’s post, I talked about the approach I’ve added to my morning routine, particularly the process of filling out a morning journal. A…Continue readingMorning Journal vs the Tracking System? This is too much. 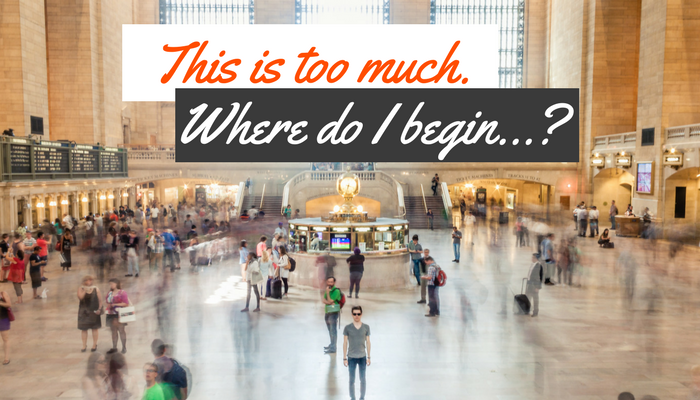 Where do I begin…? Cultivate Good Habits. Improve Your Mindset. Create a Vision. Hustle. Be Disciplined. Set Goals. Be Productive. Wake up…Continue readingThis is too much. Where do I begin…? All the above concepts are touted in the areas of personal and professional development. In some ways, it’s almost a vicious cycle. People seek help in order to take the next step—to overcome a problem or to improve a particular area, but it can be paralyzing. In the process of trying to take the next step to improve, you hear all these things you are supposed to be doing, and in doing so, you deepen your state of inaction—because you don’t know where to start. You may think, “Well I don’t have a vision, so I’d better create that, but then I have to improve my productivity, and then I have to improve my mindset…so I can’t really improve anything until I fix all those,” and in the end, you wind up doing nothing—because you need to return to your survival mode. How can anyone improve all those at the same time and see a difference in their lives the next day? And in many cases, people actually feel worse about themselves, because they start taking inventory of all the things they are not doing. And that certainly doesn’t lead to individuals overcoming their challenges or achieving their dreams more easily! One of the most common questions I hear is with regard to not knowing how to take the next step. It’s very easy to get caught up in realizing everything you’re not doing as described above, and that can be justification for not making expected progress in your life. This is why I am focused on resources that can help you take action. It’s even one of the reasons I use the word “optimize” because it’s like what we do in engineering—let’s yield a high quality product with minimal cost (i.e. yielding an even higher quality product for 100x the cost, in time/money, may not be profitable nor will it provide you the supply you need for your customers tomorrow!). If we’re looking to improve something, we don’t necessarily want to take a year to get our systems in place; we typically need a different result as soon as possible and need to “optimize” the current situation for the better. And while it’s important to have good systems in place, realistically people need to see improvement more quickly. Therefore, I suggest taking action as soon as possible (while keeping in mind the overall system you’re aiming for in the future). I’m concerned that if you work on the system and don’t take action immediately, you’ll get so focused on perfecting the system that nothing will actually get done in the process! Over time, you’ll find that the small improvements will compound, which is often discussed in the Kaizen approach. And if you do this intentionally, knowing the overall system or place you want to wind up, you’ll find that life helps you “course correct” along the way. But you can’t “course correct” unless you start taking action. Just start working on what makes sense. While it’s important to take time to reflect and take a step back, don’t do that for days on end while waiting for an epiphany. Take a break and then get back to the task at hand. If you’re not happy with your current situation and want a change in your life, keep doing #1 while also investing in yourself: take a few minutes each day to think about your overall system. If you’re stuck not necessarily in terms of wanting a career change, but you want to feel better about yourself in terms of discipline or productivity, try to implement one small change while you continue to invest in yourself (described above). For instance, if you can’t bring yourself to start something you don’t want to do, create a spreadsheet (described in Optimize for Victory) and track your progress on simply working on it, with no expectation to how much time you spend on it. Your goal is to ensure the time you spent on it each day is simply not zero (0). To wrap up, if you’re feeling overwhelmed, it’s understandable. It’s easy to “go down the rabbit hole” so-to-speak when you’re looking to make a change. Start small and enjoy the compound effect of small improvements each day as you keep your intention about the new person you want to be (or new career, or whatever it is your heart desires!). And one final note: I’ve noticed that as hard as it is to start something I don’t feel keen on doing, it typically doesn’t seem as bad once I’ve begun it, and I often feel a sense of relief and a release of tension for at least finally starting it!